Marc is a veteran lifter with more than 20 years of bodybuilding experience. Unfortunately, as he tells it, not all of that time has been productive. For much of that time, Marc was working hard but seeing very little muscle building progress. But about 10 years ago Marc was fortunate enough to get turned on to some solid training advice. And, as is true with virtually all trainers, once Marc learned and applied these basic principles, got his nutrition, supplementing and training in order, he started seeing amazing results. In fact, he achieved better results in 90 days than he had in his previous decade in the gym. 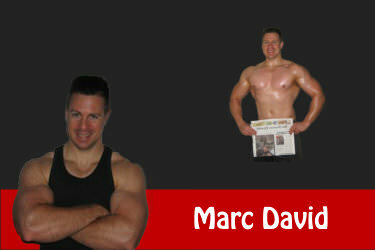 This success led Marc to passionately pursue even more fitness and bodybuilding knowledge. He became a certified ISSA personal trainer and has, over the years, become known as the “Beginner’s Expert”. He wrote No Bull Bodybuilding, a guide designed to help complete beginner’s avoid the beginner’s mistakes and years of frustration that too often and quite unnecessarily disrupt progress. Because he was once “that guy”, few are better qualified to transition no-results newbies into knowledgeable trainers who get fast results. And few do it better. No Bull is a great resource and one of the relatively few ebooks to receive a 5 Star rating by this guide.